Even though these machines carry that "Pro" designator appended to the end, that term is little more than a marketing one. It is more than professionals that flock to Apple's more capable portable laptops. Apple has a wide-ranging lineup with a 13-inch MacBook Pro with Function Keys which was not updated this year. Right above it is the newly updated 13-inch Touch Bar MacBook Pro, which we've already reviewed. Then there is the 15-inch MacBook Pro with Touch Bar, which comes in a few different configurations with either an i7 or i9 Intel processor. For this review, we will be tackling the base model 15-inch MacBook Pro which comes equipped with 16GB of DDR4 RAM, a 2.2GHz six-core i7 Intel processor, a Radeon Pro 555X AMD graphics card and 4GB of VRAM. We expect that this will be Apple's most popular model for users looking for a capable machine with a larger screen than the 13-inch MacBook Pro, rather than the i9. From the exterior, nothing on the outside has changed from the last two iterations on the current MacBook Pro design. It remains well engineered, largely crafted from that single block of aluminum. That unibody design looks nice, sleek, and remains one of the most portable pro machines we've tested. There are still two Thunderbolt 3 ports on each side, with the right side also keeping the headphone jack. For now. Once opened up, we see the same 15.4-inch Retina display that we've had for a few years. It is an extremely capable display that looks great and supports the P3 wide color gamut for excellent color reproduction. Bezels are still a bit excessive when compared to the rest of the industry, but that seems destined to be changed during a larger design refresh than this iterative spec upgrade. Apple's all-glass trackpad still remains best-in-class, which goes a long way towards getting work done on-the-go. Above that trackpad though, is a keyboard that looks the same as previous models, but has a lot of improvements under the hood. We spend a lot of time around here typing away on our MacBook Pro keyboards. Which means, over a few years time, we've become quite accustomed to Apple's super-slim butterfly mechanism. If you love it or hate it, that assessment isn't going to be changed by this new third-generation design. It is essentially the same on the outside that we've seen the past several years with a couple important improvements this time around. As Apple is quick to note, the new keyboard is quieter than the before. Some have said it is a minor change, but personally, I find it more substantial than that. There is a clear audible difference between the two and it was instantly notable. This may be more of a side effect of the other notable change -- a silicone barrier meant to prevent the ingress of debris. iFixit discovered this super slim membrane, and since then the internet has been wild with speculation, wondering if this was the primary design change, and the noise suppression only being secondary. After a bit of testing, it appears that this membrane definitely helps prevent the smallest bits of dust from entering the sensitive internal mechanism, but doesn't completely solve it. Only time will tell if it will significantly improve the longevity of the MacBook Pro keyboard. Some teardown establishments feel that it will, but we'll see with time. Typing-wise, it feels nearly the same as last generation, with not too much vertical movement, though they do seem a bit stiffer this time around. That could also be attributed to this being a new machine, and it may soften over time. Obviously, the Touch Bar is still here, which while it has a few neat tricks here and there, has largely gone unfulfilled in its potential. Only in a few situations do we prefer it over a standard set of function keys. Touch ID is still quite useful, but we prefer logging in automatically using our Apple Watch to even using our finger. No, we aren't talking about the processors just yet, but rather the display. Even if the built-in display hasn't been upgraded, Apple did include True Tone for the first time on a Mac. What it does is adjust the display's white balance depending on the ambient lighting in the room. Florescent lighting vs warmer incandescent bulbs can have different tints of white, leaning bluer or yellower. By adjusting the display to match the lighting, it makes it easier on your eyes. Not only does it work on the internal display, but it works with certain external monitors as well including the LG UltraFine series and Apple's Thunderbolt display. True Tone utilizes a pair of sensors built into the MacBook Pro's display, so it is required to be open to work with external displays. I've been thrilled with True Tone, and legitimately one of our favorite features for everyday use. But, professional video and photo editors will want to disable it before they break out the calibration gear to know the actual color, rather than having the display be easier on the eye. Internally, there are quite a few changes Apple has made this time around, that many may not even notice at first blush. Take Bluetooth 5 for example. Bluetooth 5 is a huge improvement over Bluetooth 4.2. It significantly increases range and bandwidth. You will need new accessories to take advantage of it, but many have already started hitting the market. Apple also added their internal coprocessor, dubbed the T2, which we first saw in the iMac Pro. This custom chip handles a lot of different system processes in the MacBook Pro. It securely handles Touch ID, assists in audio and image processing, disk encryption, and even "Hey Siri" functionality. Benefits are immediately apparent across the board. The FaceTime camera is still only 720p, but with the T2, white balance is better, there is less noise, and it works better in low light. The built-in microphones pick up voices a bit better, though there is a bit more background noise. Using FileVault disk encryption used to slow down the machine a bit, but with the T2 handling encryption, this is a thing of the past. Apple seems to have been learning a bit on the audio front with their work with HomePod and AirPods. They aren't louder, but the internal speakers are now fuller and more well balanced than in the past. It is particularly noticable in the mid and low end when we played back a variety of different music. The 2016 MacBook Pro's speakers were always excellent, but they've gotten better this time around. There has been much discussion around thermal throttling, particularly with the i9 model of the MacBook Pro. Apple did acknowledge this, and actually issued a software update patch to help correct this issue on all models of the 2018 MacBook Pro. For all our testing, we re-ran all our benchmarks after the patch and used those values for this review. As the i9 model was most impacted by this thermal issue, we'll discuss that a bit more in Sunday's i9 review. Benchmarking in 3.. 2.. 1.. go! We ran a suite of different benchmarking tests on our new MacBook Pro, and were quite pleased with the results we attained. 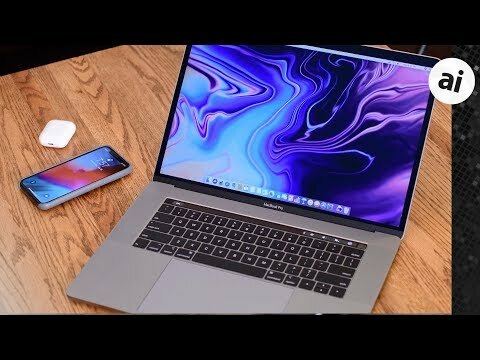 All of the tests we ran, we also ran on the top-of-the-line 2017 15-inch MacBook Pro with i9 processor, and even a few on our personal 2016 15-inch MacBook Pro. Starting out with what was least impressive, our OpenGL graphics test inside of Cinebench R15. The AMD Radeon Pro 555X is not all that different from last years graphics, and that is apparent in the test results. After running the test four times back-to-back-to-back-to-back, we averaged 88.96 FPS. Performing the same methodology on our high-end 2017 Pro, we averaged 88.57 FPS. Barely a noticeable change. What really did peak our interest, however, was the impressive results from the Cinebench R15 CPU benchmark. Last years model pulled 763, for the best you could buy at that time. This year, on the base model, we averaged 930.75. A huge difference year over year. Not only was that our average, but the test spiked to as high as 1053, far eclipsing our top results from the past two years. Standard Geekbench 4 testing yielded 4,972 and 22,009 as the single and multi-core results on our new 2018 model, compared to 4,946 and 16,599 respectively. Single core is unsurprisingly largely unchanged, but multi-core got a huge boost. This is due to the new six-core processors found inside. When looking at pure processing power, it is clear these new models are a substantial improvement. The base model 15-inch won't ever get confused for a gaming rig, but it will easily be enough to dip your toes in. We did some test exports through Final Cut Pro X, and we didn't see too much improvement between last year and this year. But, when I ran the same 4K export on my 2016 MacBook Pro, I saw a substantial decrease in export times. In fact, my 2016 MacBook Pro took 50 percent longer than the new Pro, after averaging three test exports of a 4K clip. Regarding battery life, in our testing, it seemed pretty on par with previous generations. Technically, the battery has been increased quite a bit, but that is more to compensate for the faster DDR4 RAM and more power hungry processors. Apple rates it for about ten hours of use, which is fair under a light load. If you are tackling some intense video editing, that comes down to about three. We're pretty happy with these results. Sure, we didn't see a redesign of the exterior, but that shouldn't undercut the laundry list of other improvements we saw this year on the 2018 15-inch MacBook Pro. This is the largest amount of improvement we've seen when it comes to an off-year obligatory "spec bump" upgrade. The choice between the 2017 and 2018 13-inch MacBook Pro is pretty obvious, but it is far less so with the 15-inch model. It's probably not worth upgrading from the 2017 15-inch 2017 MacBook Pro with i7 to the 2018, but if you've been waiting to take the plunge from an older model, even the 2016 15-inch MacBook Pro now is a good time, considering that the next round of processors that will go in the MacBook Pro aren't expected until the tail-end of 2019. Performance has increased leaps and bound, making this one of the most capable base model machines Apple has ever released. Apple authorized reseller Adorama is knocking $100 off every 2018 15-inch MacBook Pro with Touch Bar with coupon code APINSIDER when used with this shopping link. Adorama also will not collect sales tax on orders shipped outside NY and NJ, potentially saving shoppers up to $635 compared to buying from Apple. For the lowest prices and best deals across multiple resellers, please visit our 2018 15-inch MacBook Pro with Touch Bar Price Guide. And for step-by-step instructions on how to redeem the APINSIDER coupon code, please see our savings guide. Note for the regulars: In previous years, we may have combined these MacBook Pro reviews into one big one. However, we decided that there were enough differences in both hardware, and target markets to do three pieces. You'll also note that they have three different authors. That is intentional, and has more to do with getting different perspectives on the hardware, and, frankly, different use cases. The i9 with 32GB of RAM review will be published at around 11AM ET on Sunday morning. It would be interesting to note if there is much of a real world difference between the 2.2 and 2.6 model one since there really is only a $100 difference between similarly optioned models. ($300 between 2.6 and i9). "The MacBook Pro's speakers were always excellent." Unfortunately, that is not at all the case, even on the 2018 models. The spatialisation, stereophony, frequency range, frequency neutrality, were all far from perfect. When you hear music, do you fully and clearly distinguish the left and right channels? No (just compare that with headphones). Does the sound surround you? No, it is clear it comes from a (rather narrow) source in front of you. Are all frequencies, including bass, mid and high, distinct and present? No. It is clear many frequencies are either weak or absent. Claiming the sound is excellent is totally exaggerated and inaccurate. Whether it is better (or less worse) than other laptops does not change that. Being less worse than the rest does not make excellent. In the Hidden upgrades section, there is a major hidden drawback missing. Many users have reported unexpected reboots, most likely tied to the T2 chip. The same issue has appeared with the other computer with this chip, the iMac Pro. Given the MacBook Pro high price, and the fact that the issue has already been identified by Apple after the release of the iMac Pro many months ago, this issue is hardly acceptable. I LOVE my 2017 15” 3.1 ghz MBP. It is currently in the shop now for keyboard repair and strange graphical glitches (not sure if hardware or OS problem) and cankt wait to get it back. Using Final Cut is an orgasmic pleasure and can’t wait for mojave and dark mode. I am in a computer science program in grad school and it keeps up almost flawlessly with everything I need to do, most importantly, run multiple VMs with a decent amount of screen space on the go. Boot camp Windows 10 is also faster than any PC I’ve seen/ used. Battery life is impressive. What I would like to see changed is user changeable batteries, RAM, startup sound returned (it makes diagnosing problems so much easier), and of course, user repairable keyboard. I'm extremely impressed by the price, especially for the kind of machine I would like, could I afford it, at $3,800. Not sure how you assign your 4.5 points, but on affordability alone, 4.5 points seems excessively generous. We talked about this on Thursday. "Many" is a gross exaggeration. Are there some? Yes. Is it a plague? Not even close, and it is one nearly always fixed with a software reinstall. We're continuing to look into it, but it appears to be somehow related to software that plays fast and loose with developer's guidelines set forth about the T-series chips. I'd like to see the startup sound replaced. It is a valuable troubleshooting tool, like you said. I don't think that we're ever going to see user-changeable batteries, upgradeable RAM on a MBP ever again, and the rest of the industry is headed in the same direction. We'll be talking about this a bit tomorrow. Is there no way to add one, at least for you own Macs or Macs you deploy/manage? I’ve seen some guides that create an application you call from your Login Items, but I mean from the actual boot (as I assume you’re referring with your troubleshooting mention). Yeah. I'm talking about the POST beep. It's full-on gone, and the terminal command to add it back in is gone as well. This criticism is ridiculous. No, strangely enough, the speakers in this small laptop aren’t $30,000 audiophile grade. They’re not perfect. But they’re excellent for a laptop. Probably because of a guy named Tomlinson Holman. You might not recognize the name unless you’re a true audiophile. But you might know the initials. TH. As in THX. As in the guy who invented it. Yes, the speakers on the MBP sound amazing. Deal with it. The fact that he mentions "perfect sound" is ridiculous enough that I stopped reading after that. Here's a pair of questions to try to clarify the power-vs-performance balance: at idle (email/writing text/web browsing) is the 2.2Ghz + 555X noticeably more thrifty with power than others? And at full chat (continuous compiling/transcoding/whatever), what is the _actual_ sustained speed for the 2.2 vs. 2.6, i9? Those are two questions which no review has touched. Vadim (one of AI's video guys) has addressed this a bit in the post right above yours. Battery life measurements over a week beyond generalizations are useless and nowhere near enough time to get a good set of data regarding percentages and whatnot. We'll be revisiting most of these machines in about six months regarding that. Huge bezels in 2018 look ridiculous and lack of FaceID is a HUGE MISS! Nobody wants yesterday's technology in a premium priced MBP! Why do back to TouchID after you already have a iPhone X?! Also odd to me is the lack of a cellular option or slot, why offer it in iPad but not MBPs? It would be great to see a disk speed comparison for the new models!! Can you clarify which systems (CPUs) are base, mid, and i9 here? The base model with the 6-core 2.2 GHz CPU averaged 3.05 GHz? If so, Intel put this chip into the wrong bin? These Cinebench scores are all of +/- 1% different. Why even bother with higher end models if so? Then, how often does the i9 actually hit 4.8 GHz on one core? For all practical purposes, never? The bigger cache on the i9 looks like it isn’t even helping for this benchmark. Another advantage of the T2 chip is the ssd controller is located there. It not only helps with the encryption speed, but delivers amazing IO speed altogether! In combination with APFS of course.